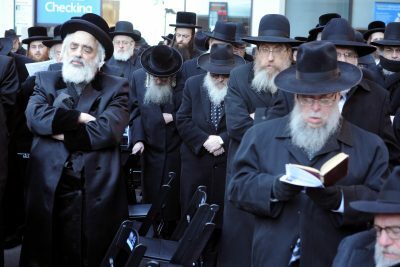 Jewish communities in Britain and France, London and Paris, together with the rest of Europe are now reconsidering their unqualified support for the state of Israel in terms of money and arms which they concede are used for the subjugation of the Palestinian people in the Occupied Territories. They have previously always maintained that this was necessary in order that the state of Israel survives as a political entity for otherwise it would be overrun by Muslim Arabs who have a higher birth-rate, generally, than the Indigenous Israeli. Now, however, they are forced to come to the conclusion that such support for such a regime can only realistically be described as, at best, anti-democratic and, at worst, bordering on fascism or neo-colonialism whereby the indigenous Arab people are subjected to continuous harassment and violence, and in many cases being actually killed by the occupying security forces. To support such is not only contrary to Jewish law and ethics but is now clearly counter-productive. The policies of the hard-Right Israeli government have caused an increasing reaction throughout the world but particularly so in Europe and also in America, that now manifests itself as antisemitism i.e. it now tars every Jew as a latent supporter of neo-colonial ideology. There have been warnings both to the Israeli government and to religious and civic leaders of the Jewish communities throughout Europe over many years but they made a decision not to listen. This was partly due to the fact that the largest Jewish community outside Israel, i.e. in the Diaspora, is in the United States of America which is governed essentially by the US Congress. Congress, in turn, is heavily influenced by the Israel lobby, AIPAC, which although not the most powerful in either financial or membership terms is nevertheless considered the most influential upon the US legislative process and upon the Presidency in respect of foreign policy. The means that AIPAC is able to use its influence to indiscriminately support Israel’s hard-Right government with billions of dollars of aid and arms in its illegal occupation of Palestinian land and settlements in which over 600,000 Israelis now live in direct violation of the will of the UN Security Council. All this has now culminated in an increasing backlash of animosity not only against Israel itself but also against all those who either overtly or covertly support the extreme Right-wing policies of the Netanyahu government. As indicated, this feeling of animosity against Israeli policy has now morphed into overt antisemitism whereby most Jewish communities are now seen and labelled as pro-Israel and anti-democratic. The consequences of this scenario are immensely serious. It means that the half a million Jews in France and the quarter of a million in Britain now live in, if not fear then in apprehension of a period in Europe similar to that of the 1930s in Germany whereby antisemitism grew exponentially and which, of course, led to the horrors of the Holocaust. It is not expected that there will be another Holocaust but it is anticipated, in many (Jewish) quarters, that there may well be an exodus of Jews from the Diaspora to Israel as the only sanctuary available. This is in view of that which has transpired but which has only transpired owing to the extraordinary arrogance, or possibly stupidity, of the indiscriminate support for a regime whose policies are clearly anathema to the average European and in opposition to the principles of western democracy. Of course, the other side of the coin, from the Israeli perspective is that it is more than happy for all Jews in the Diaspora – that is the majority of the global Jewish population, to sell-up and bring themselves and all their assets to the state of Israel. That is an objective that has been articulated by more than one Israeli government minister as being, from the point of view of the Israeli state, the optimum scenario but from the point of view of the approximately eight million in the Jewish Diaspora, would be a disaster if not a complete catastrophe.